The research programs of our group span a wide range of topics related to the structure of cirucmstellar disks around young stars and the formation of planets. The main goals of the ongoing projects are (i) to understand whether the formation of a planetary system is the natural outcome of the stellar formation process, rather then a lucky event, (ii) to study how, where, and when planets form, and (iii) to link the architecture of planetary systems to the properties of the parent circumstellar disks. While there is no doubt that the nature has is own way to form rocky and gaseous planets (we are sitting on one of them! ), understanding this process has kept astronomers and astrophysics busy for many decades. One of the reasons is that the formation of a planets like, for example, our Earth requires tiny solid particles to interact and stick together to form aggregates of thousands of kilometers in size. The formation of planets spans more than 10 orders of magnitude in spatial scales and involves microscopic processes, such as Brownian motions, grain surface activity, and coupling between dust and gas, as well as macroscopic processes, such as turbulent mixing and self gravity. In the last twenty years, we have learned that planet formation most likely occurs in the densest regions of circumstellar disks around newborn stars where the physical conditions are the most favorable for small dust grains to interact. However, only recently, and thanks to the improvements in long-baseline interferometric techniques, we have been able to observe this process. The figure above shows the maximum size of dust grains around two young stars as a function of the orbital distance from the star and reveals that the largest observable dust grains, 1-10 cm in radius in this case, are preferentially located within 20 AU from the central star. This is the region where the formation of rocky planets is more probable. We have developed the methodology to measure the grain size distribution as function of the orbital distance (Isella et al. 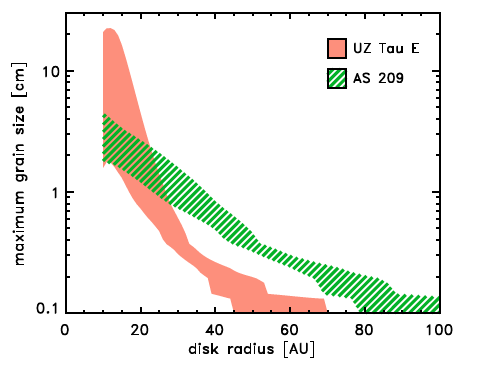 2010) and obtained the first compelling observational evidence that the evolution of solids in circumstellar disks depends on the distance from the central star (Perez et al. 2012). We are now focusing in enlarging the observed sample and making these measurements more robust.